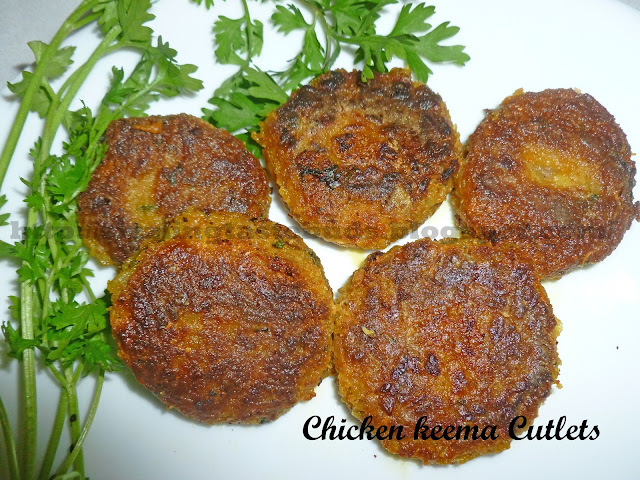 This month while on Grocery shopping, I bought this frozen Chicken Keema from the Super Market only to have this yummy delicious Chicken Keema Cutlets. I prepared this when my inlaws were around and it didn't disappoint me as everyone liked it. It goes very well as the Starters or as a side dish with the main course. Place these between the burgers or bread slices and send it to kids lunch boxes and I am sure they are gonna like this as Chicken Burgers or Chicken Sandwich. "Keema is nothing but minced ( Chicken/ Mutton)"
1. Boil, peel and mash the potato and keep aside. 2. Heat 2-3 tsp oil in a wok and add finely chopped Onions and fry till they turn slightly brown in color. 3. Add Ginger- Garlic paste and saute it for a minute. 4. Add Chicken keema and cook it till its done. Add amchur powder, haldi, red chilli powder, garam masala powder and salt as mentioned and fry it for 2-3 minutes. 5. Now sprinkle little water and add mashed potatoes and finely chopped Coriander leaves. 6. Shift this mixture to a plate and cool it. When cooled, make small balls out of the mixture and slightly flatten it by pressing it between your palms. 7. Beat an egg and add salt to it. Dip each cutlet mixture into this beaten egg and roll it on corn flour or bread crumbs and fry it on a frying pan till they turn golden brown in color. Enjoy this and do let me know how it tasted. Your chicken burger recipe is definitely something worth trying out! This can be served as a snack or light dinner for family and friends. Thank you for sharing your recipe, this is another way of preparing burgers so that we will not get bored.